Every year, Alberta Culture staff come together for an annual Fall Gathering. This year’s event, which took place in early October, was jam packed with unique information and workshops, designed to offer us practical help in our work. The event allows us as members of the Alberta Public Service to get to know other staff from across the Ministry of Culture and to learn more about what we all do each day for Albertans. 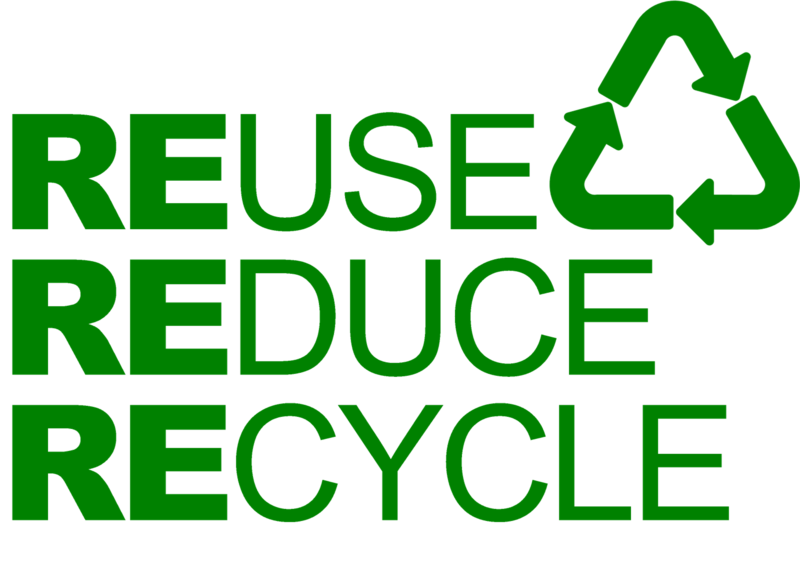 It’s our goal that this directly translates into the work we do each day to help engage communities and people across the province. This year, I joined Larry Pearson, Director of Historic Places Stewardship with the Historic Resources Management Branch, to offer a workshop on “Heritage Conservation and Sustainable Community Development.” We didn’t just want to show our colleagues what we do to protect historic places, we wanted to demonstrate how protecting these places contributes to the “triple bottom-line” of economic, social, and environmental sustainability. 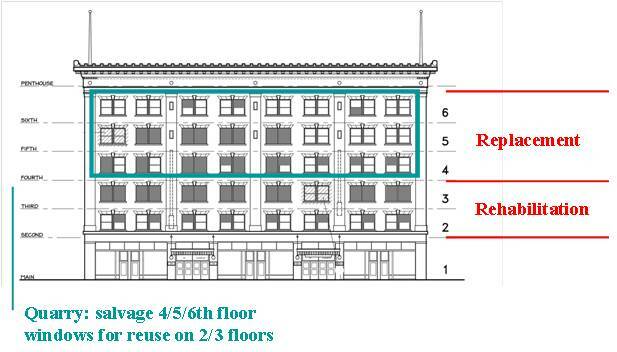 Schematic drawing of the Lougheed Building (Provincial Historic Resource) in Calgary, which was a case study in the presentation. So many people were interested in the presentation, that we thought it would be worth sharing here on RETROactive. Most people understand the importance of the oil discovered at Leduc in 1947 and the oil and gas discovered in Turner Valley in 1914. However, Alberta’s oil and gas industry began in 1901 with an isolated oil well alongside a creek near the Canada-United States border. 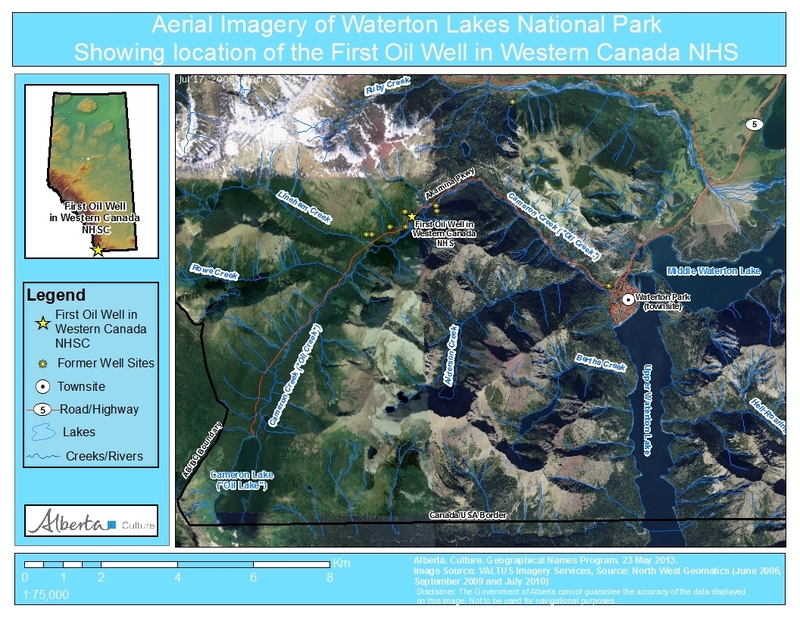 Aerial Imagery of Waterton Lakes National Park, showing the locations of the Cameron Lake (formerly Oil Lake) Cameron Creek (formerly Oil Creek) and the First Oil Well in Western Canada National Historic Site of Canada. The lake and the creek were noted, but not named, on George Dawson’s 1884 map of the Bow and Belly River region of the North-West Territories. During his surveys of the area in the 1880s (with the Geological Survey of Canada) and earlier (with the International Boundary Commission) in the 1870s, Dawson was made aware of oil and gas in the Waterton region. In 1901, the Rocky Mountain Development Company drilled Western Canada’s first oil well alongside a creek, which soon became known, for obvious reasons, as Oil Creek. In 1915, during the survey of the Alberta-British Columbia border, the lake and creek were again noted. The 1917 report on the Alberta- B.C. boundary described them as: “Cameron Lake, a picturesque sheet of water, one mile and a half long by half a mile wide” and “Cameron Brook, a stream of considerable size, which flows to Upper Waterton Lake”. The lake and creek were named for Maj.-Gen. Donald Roderick Cameron, a Scottish-born Royal Artillery officer and son-in-law to Sir Charles Tupper. Prime Minister John A. Macdonald recommended Cameron’s appointment as the British Boundary Commissioner and head of the British-Canadian delegation to the International Boundary Commission. From 1872-76, Cameron oversaw the surveying of the Canada-U.S. border between the Lake of the Woods (in western Ontario) to the Rocky Mountains. 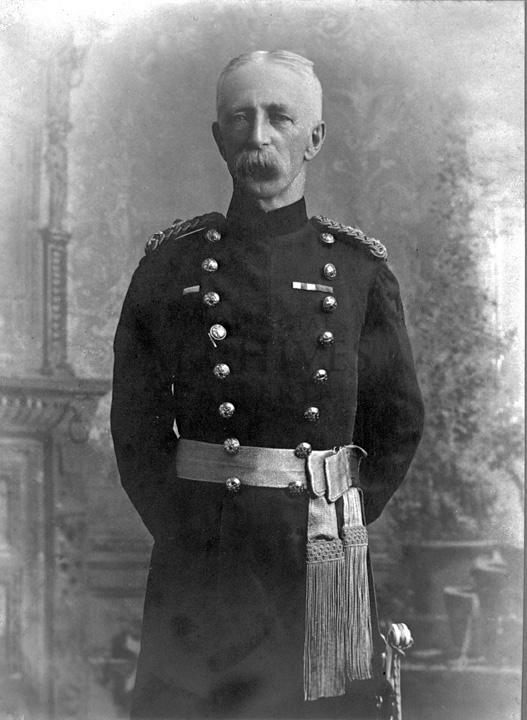 He later represented Canada on numerous international commissions and conferences through the 1880s and he served as commandant of the Royal Military College in Kingston, Ontario from 1888 to 1896. For his services to the boundary commission he was appointed to the Order of St. Michael and St. George by Queen Victoria. General Cameron died in 1921. In 1943, Cameron Falls, just north of the Waterton Park town site, was also named in his honour. Capt. Donald R. Cameron, head of the British-Canadian contingent of the International Boundary Survey, in 1872. In 1915, the Geographic Board of Canada adopted Cameron Brook as the official name for the creek. Although, the name of the lake was not officially changed at the time, it nevertheless began appearing on federal government maps as Cameron Lake. The name Cameron Lake was officially adopted in 1928. The following year, the United States Board on Geographic Names adopted the same name for the portion of the lake located in Montana. In 1960, the Canadian Board on Geographical Names renamed Cameron Brook as Cameron Creek. 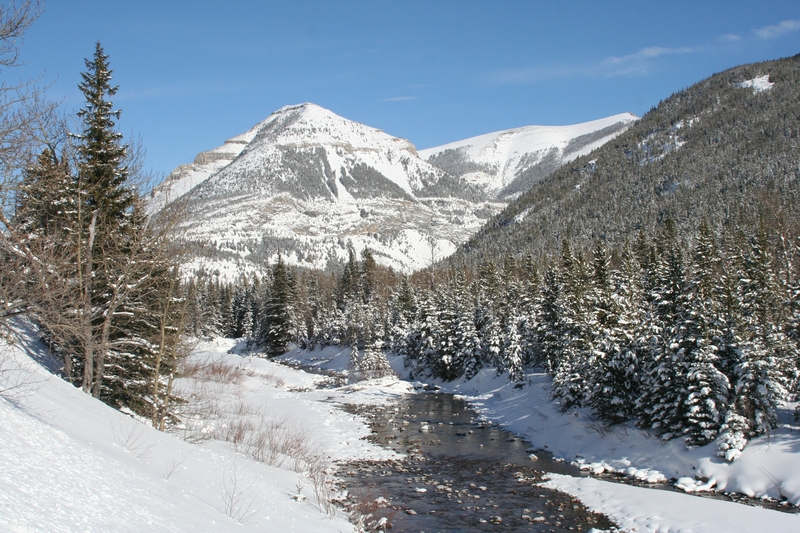 Cameron Creek, formerly known as Oil Creek, flows through the rugged terrain of Waterton Lakes National Park. Western Canada’s first oil well was located alongside this creek. Although the names Oil Lake and Oil Creek are no longer official, the significance of the area in the development of Canada’s oil sector is commemorated by the Historic Sites and Monuments Board of Canada. In 1965, a monument was erected at the site the original oil well and the site was named the First Oil Well in Western Canada National Historic Site of Canada. Description: Flows into Upper Waterton Lake within the Waterton Park town site. Description: On the Canada/US border approximately 11 km south west of the Waterton Park town site and 1 km east of the Alberta/British Columbia boundary. Edwards, Victoria. “Major General Donald Roderick Cameron C.M.G.” eVeritas [electronic newsletter of the Royal Military College Club], available from http://everitas.rmcclub.ca/?p=4485. (Accessed 16 Oct 2013). Parks Canada. “First Oil Well in Western Canada National Historic Site of Canada,” [webpage], available from http://www.pc.gc.ca/docs/v-g/pm-mp/lhn-nhs/puits-well_e.asp. (Accessed 16 Oct 2013). Rees, Tony. Arc of the Medicine Line: mapping the World’s Longest Undefended Border across the Western Plains. Lincoln, NB: University of Nebraska Press, 2007. Earlier this year, the Alberta Heritage Markers Program installed a marker on the banks of the Sturgeon River in St. Albert. 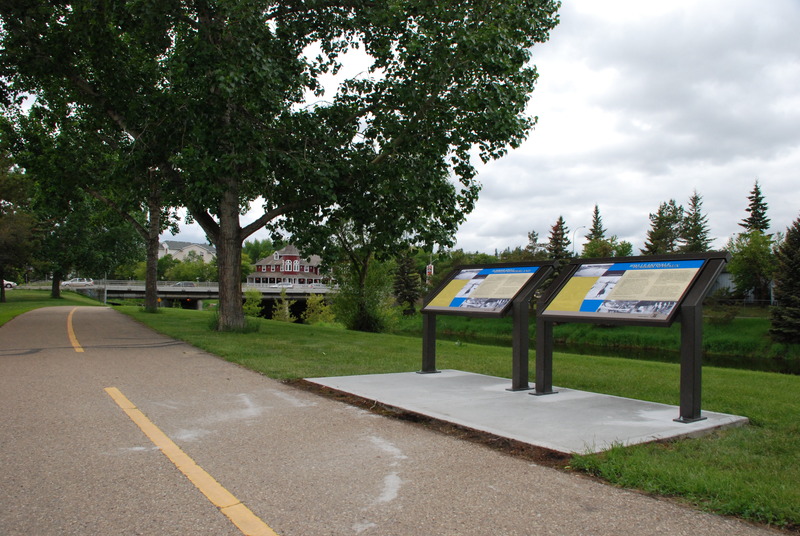 Our heritage markers can be found along walking trails and roadside pull-offs throughout Alberta, offering glimpses into the past. This marker tells us how the people of St. Albert related to the Sturgeon River, which winds through their community. a new heritage marker along the Sturgeon River. Before it reaches St. Albert the Sturgeon River has meandered about 180 kilometres from its beginnings in Hoople Lake west of Isle Lake. After it leaves St. Albert the Sturgeon continues flowing eastwards to Fort Saskatchewan, and empties into the North Saskatchewan River. The Sturgeon River became landmark and destination, the passing of time measured by seasonal opportunities to have fun and build community. On its banks and in its refreshing summer waters families played, groups held picnics and went boating, and young people paddled Sunday afternoons away. “In the winter, it was our skating rink and landing spot when we slid down the bank on our sleds,” recalled Dorothy Bellerose Chartrand. It was a hockey rink too where tin cans and frozen horse manure stood in for pucks. For a brief time a steamer, La Thérèse, chugged lazily up and down the river. “I believe the river was much bigger then,” Jane Ternan Sherwood reminisced in the 1980s, remembering riding in the steamer in 1912. Memory had made the Sturgeon wider and more exciting, rekindling the joy of a small child splashing happily at its edge. Prepared by: Michael Thome, Municipal Heritage Services Officer. Board tours the Nordegg/Brazeau Collieries Mine Site. 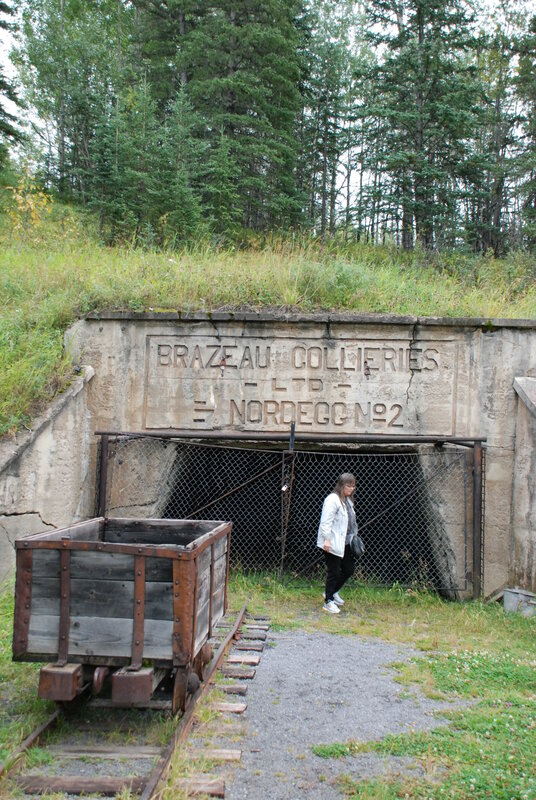 With the September meeting of the Alberta Historical Resources Foundation held in Rocky Mountain House, board members and staff took the opportunity to visit the Nordegg/Brazeau Collieries Mine Site. We enjoyed a great walking tour of the Nordegg/Brazeau Collieries Mine Site, led by the informative staff of the Nordegg Historical Society. 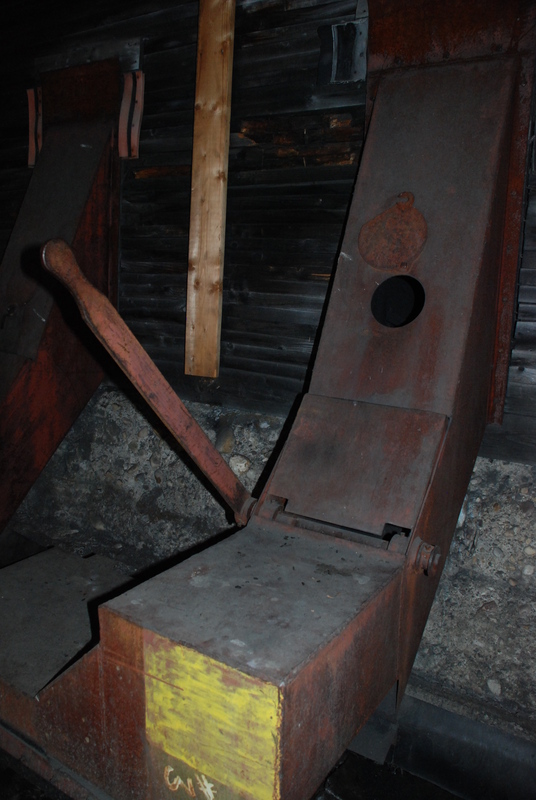 Designated as a Provincial Historic Resource in 1993, the site of consists of several industrial structures, support buildings and related machinery associated with the coal-mining operations of the Brazeau Collieries between 1911 and 1955. 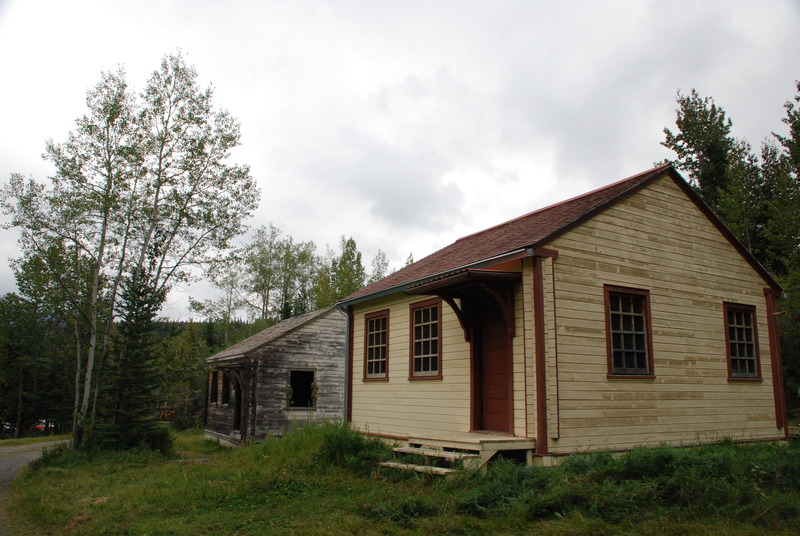 The site is being restored through a partnership between Clearwater County and the Nordegg Historical Society, with conservation funding from the Foundation’s Heritage Preservation Partnership Program. It was exciting to see this Provincial Historic Resource–large and complex with a variety of heritage values–steadily being restored and revitalized. AHRF board beginning it’s tour of the Nordegg Mine Site. Val Clark peeking into one of the mine shafts at Nordegg. 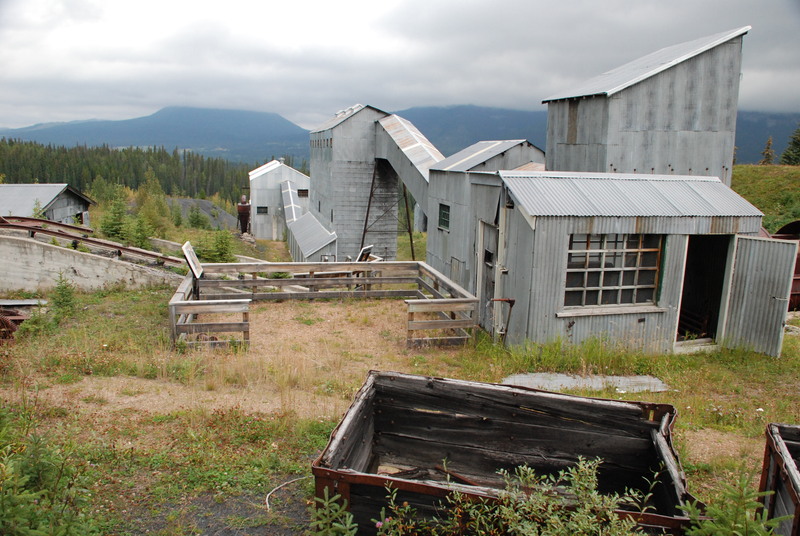 Several buildings at the Nordegg Mine Site. Two miner’s cabins, one of which has been restored. 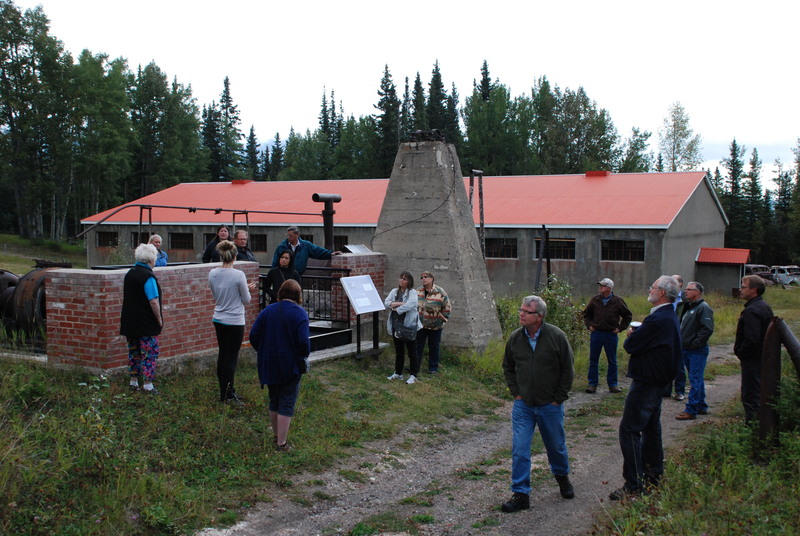 Following the tour, we had an informal meeting with the society and representatives of the Clearwater County in the Nordegg Museum, where everyone learned a great deal about the restoration and interpretation of this historic mine site.